Comfort, is no longer a luxury that only royalty can afford. The King Charles Matelassé Bedspread - made from the finest stonewashed cotton and with unwavering attention to detail - provides the utmost in comfort and appearance. While you may not live like a king, there is no reason you cannot sleep like one. Modeled after the classical art styles found in Historic Charleston, the King Charles Matelassé Bedspread provides the highest level of comfort and class. Every piece of the King Charles Matelassé Bedspread is made from 100% cotton to ensure the greatest quality possible. French Jacquard looms utilize a matelassé weave to beautifully mimic the hand-stitched quilts native to Marseilles, and transform the cotton into a tapestry of perfectly lain peaks and valleys. This age-old process not only creates wondrously thick and soft linens, it also brings the rustic patterns to life. Modern techniques ensure that every stitch is perfect, while stonewashing completes the flawlessly smooth and soft feel of the King Charles Matelassé Bedspread. The end result looks rich and feels thick, without sacrificing any of the comfort that can only be found in 100% cotton. The King Charles Matelassé Bedspread includes: the bedspread, a coverlet, and two pillow shams. Each piece of this complete set is a work of art unto itself and provides luxurious comfort. Featuring exquisite craftsmanship normally reserved for fine china, the perfectly rendered details on every inch of the King Charles Matelassé Bedspread are a beauty to behold, and a joy to sleep on. Adorned in rustic motifs, this bedding evokes the comforts of a simpler time, while maintaining the conveniences of modern living. Each piece of the King Charles Matelassé Bedspread is machine-washable, making maintenance as easy as falling asleep at night. Woven to last, your grandchildren will find this bedding just as exquisite as you did the day you bought it. This bedspread is perfect for anyone looking to add a pastoral touch to the bedroom, as well as anyone who enjoys a gentle night’s slumber. Combining luxurious comfort and ease of care into a gracefully regal design, the King Charles Matelassé Bedspread is an ageless masterpiece of style and functionality. This product was added to your set below. Comfort, is no longer a luxury that only royalty can afford. The King Charles Matelassé Pillow Sham - made from the finest stonewashed cotton and with unwavering attention to detail - provides the utmost in comfort and appearance. While you may not live like a king, there is no reason you cannot sleep like one. Create a cozy, regal atmosphere in the bedroom with this King Charles Matelasse Pillow Sham, modeled after the classical art styles found in Historic Charleston. The King Charles Matelassé Pillow Sham provides the highest level of comfort and class. The King Charles Matelassé Pillow Sham is made from 100% cotton to ensure the greatest quality possible. French Jacquard looms utilize a matelassé weave to beautifully mimic the hand-stitched quilts native to Marseilles, and transform the cotton into a tapestry of perfectly lain peaks and valleys. This age-old process not only creates wondrously thick and soft linens, it also brings the rustic patterns to life. 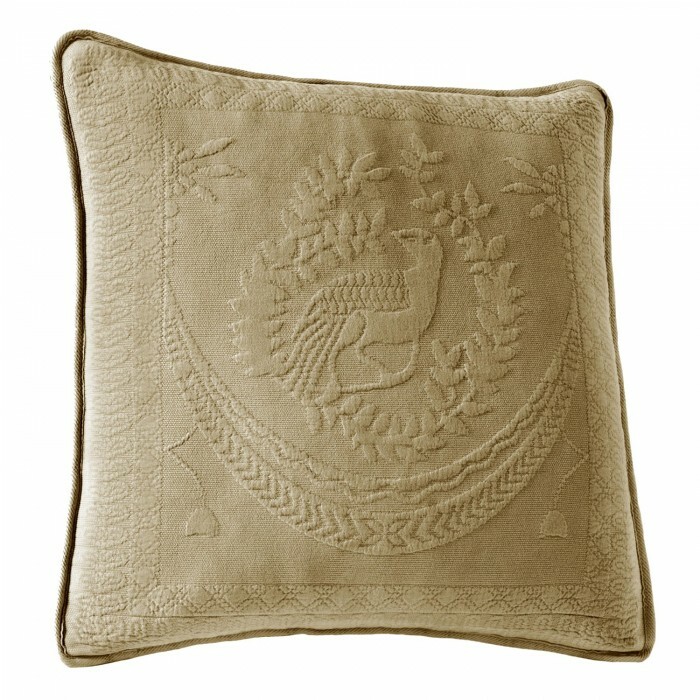 Modern techniques ensure that every stitch is perfect, while stonewashing completes the flawlessly smooth and soft feel of the King Charles Matelassé Pillow Sham. The end result looks rich and feels thick, without sacrificing any of the comfort that can only be found in 100% cotton. 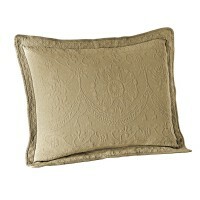 The King Charles Matelassé Pillow Sham features exquisite craftsmanship normally reserved for fine china. The perfectly rendered details on every inch is a beauty to behold, and a joy to sleep on. Adorned in rustic motifs, this bedding evokes the comforts of a simpler time, while maintaining the conveniences of modern living. The King Charles Matelassé Pillow Sham is machine-washable, making maintenance as easy as falling asleep at night. Woven to last, your grandchildren will find this bedding just as exquisite as you did the day you bought it. This Pillow Sham is perfect for anyone looking to add a pastoral touch to the bedroom, as well as anyone who enjoys a gentle night’s slumber. Combining luxurious comfort and ease of care into a gracefully regal design, the King Charles Matelassé Pillow Sham is an ageless masterpiece of style and functionality. Comfort, is no longer a luxury that only royalty can afford. 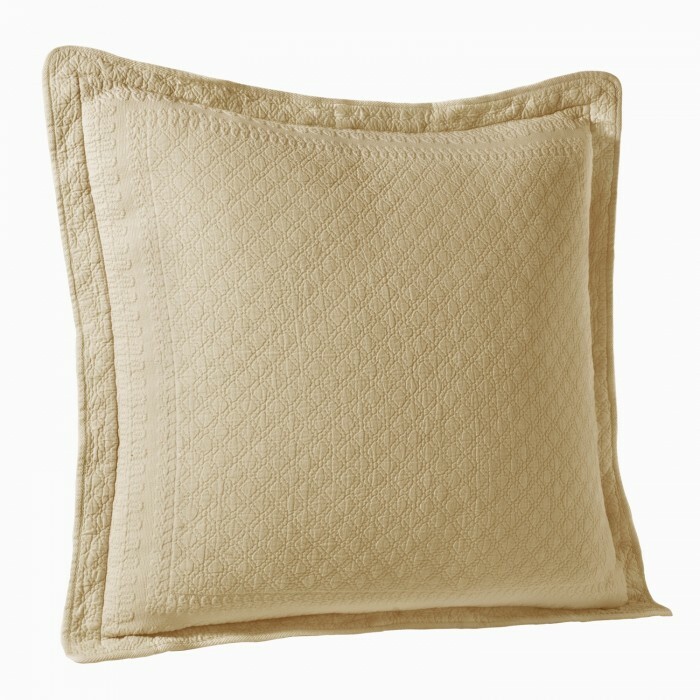 The King Charles Matelasse Decorative Pillow - made from the finest stonewashed cotton and with unwavering attention to detail - provides the utmost in comfort and appearance. While you may not live like a king, there is no reason you cannot sleep like one. Available in 18" and 20"
Create a cozy, regal atmosphere in the bedroom with this King Charles Decorative Square Pillow, modeled after the classical art styles found in Historic Charleston. French Jacquard looms utilize a matelassé weave to beautifully mimic the hand-stitched quilts native to Marseilles, and transform the cotton into a tapestry of perfectly lain peaks and valleys. This age-old process not only creates wondrously thick and soft linens, it also brings the rustic patterns to life. 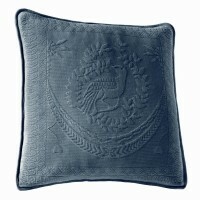 Modern techniques ensure that every stitch is perfect, while stonewashing completes the flawlessly smooth and soft feel of the King Charles Matelassé Pillow. The end result looks rich and feels thick, without sacrificing any of the comfort that can only be found in 100% cotton. 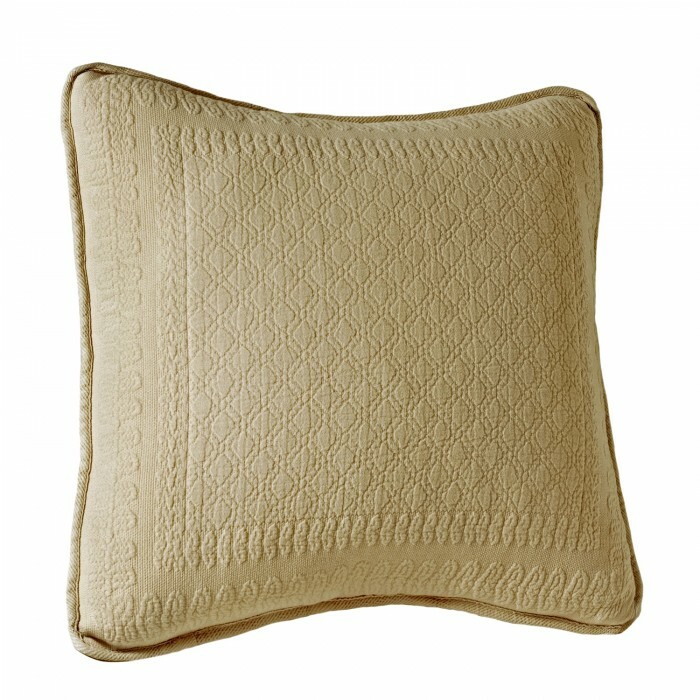 The King Charles Pillow features exquisite craftsmanship normally reserved for fine china. The perfectly rendered details on every inch is a beauty to behold, and a joy to sleep on. Adorned in rustic motifs, this bedding evokes the comforts of a simpler time, while maintaining the conveniences of modern living. 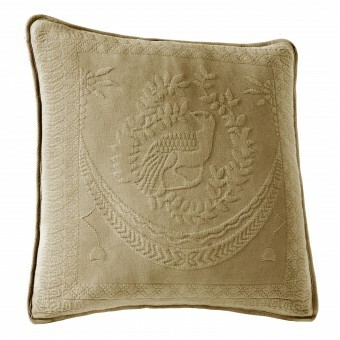 The King Charles Matelassé Decorative Pillow measures 18" x 18", or 20" x 20" with a decorative rope trim. Spot Clean. 100% Stonewashed Cotton. Made in Portugal. The color is great, the quality is great. The colors have a slightly worn look which I like. Colors are a little different from online photo, but I kept them because they are such good quality and are easy to incorporate into my decor. wrong item was shipped. it took almost 2 months to get reimbursed the $160. people were pleasant and eventually got back my money.